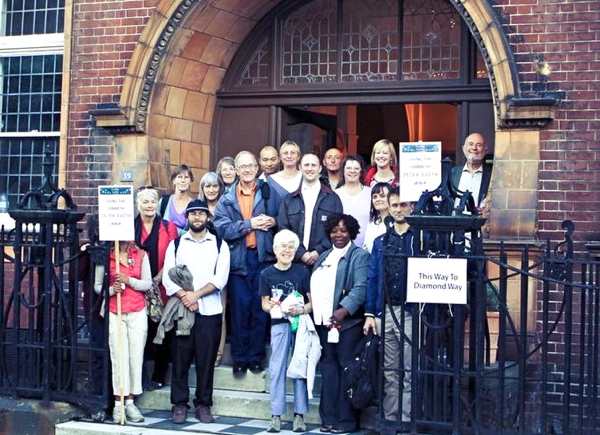 On 7 September 2013, the London Diamond Way Buddhist Centre welcomed the Interfaith Walk organised by Faiths Together in Lambeth. This borough-wide independent interfaith organisation was established to foster constructive relationships among religious communities and promote interfaith involvement in civic life in Lambeth. It has over 50 member organisations, is managed by a committee comprising representatives of various faiths, and is chaired by Rev. Alan Gadd, a retired Anglican priest. Rev. Alan Gadd has taken an active interest in the London Diamond Way Buddhist Centre’s move to Lambeth since the 2012 planning consultation for the Beaufoy Institute. Upon meeting Diamond Way Buddhism’s interfaith representative for London at the AGM of Faiths Together in Lambeth in June 2013, Rev. Alan Gadd suggested the Beaufoy Institute as a venue for Faiths Together in Lambeth’s upcoming annual interfaith walk. The London Diamond Way Buddhist Centre agreed with his excellent idea, and was delighted to be able to participate as a host.